What is unique about Dr. Jack are not the dental services he provides: he provides similar dental services as dentists across the nation. What is unique about Dr. Jack is that he, personally, provides your dental care. When was the last time you heard of a dentist who provided all of the dental care to his/her patients? When you get your teeth cleaned, Dr. Jack is the one who cleans your teeth. If you need a filling or a crown: Dr. Jack is the one who provides your care. 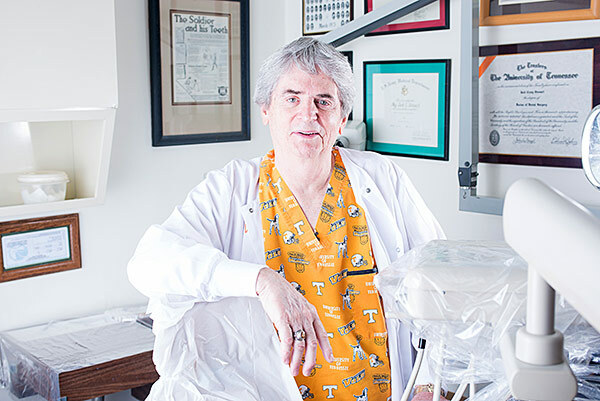 Dr. Jack enjoys providing personal care for his patients. Chair-hopping (the story of his life when he was managing the Ft. Leavenworth Dental Clinic) is a thing of the past for him. As you look at the sample list of services below, you’ll notice that there is not a separate category for “cosmetic” dental care. Dr. Jack’s philosophy with cosmetic dental care is that cosmetic’s are a part of, and consideration of, all dental care, rather than something to be singularly focused on. Aside from a healthy diet and routine brushing/flossing, regular teeth cleanings and dental exams are the most important way to maintain your natural teeth! Your comfort is important to Dr. Jack during any procedure, but all the more so when the drill comes out. That's when you will really appreciate Dr. Jack's extensive training and background. While you won't find bells and whistles at Dr. Jack's office, he does use proven technology to diagnosis and recommend treatment. He doesn't follow the modern fad of calling x-rays ``pictures``: x-rays are a valuable tool with legitimate health risks which he conservatively utilizes. Yes, the procedures no one wants! The good news is that if you require one of these procedures, Dr. Jack's extensive background will help you rest assured that you are in good hands. If you have questions or would like to book an appointment, click on the right to contact Dr. Jack Stewart.